Watch lovers who seek contemporary timepieces that have an urban edge will find what they are looking for in Urwerk’s award-winning designs. Urwerk was founded in 1997 by Felix Baumgartner, a watchmaker trained in Solothurn, Switzerland, and Martin Frei, an artist and graphic designer who graduated from the School of Visual Arts in Zurich and the School of Art and Design in Lucerne. The pair first met to discuss forming a business in 1995, and two years later the first Urwerk timepieces were unveiled. Baumgartner comes from a family with a history of watch-making, and this heritage coupled with Frei’s background in art shows in Urwerk’s innovative watch designs. The name Urwerk translates roughly as ‘original work’ (‘Ur’ was the name of an ancient Sumerian city where sundials were used to measure the passage of time). The originality of Urwerk timepieces has been acknowledged at major horological events. At the 2011 Grand Prix d’Horlogerie de Genève, Urwerk claimed first prize in the ‘Best Design Watch’ category for the UR-110 design. The first timepieces Urwerk ever produced were the UR-101 and the UR102. These were showcased in 1997 at Baselworld, the foremost annual showcase event for watchmakers and jewellers. These elegant designs feature a mostly opaque face with a curved window along the uppermost edge, in which the number corresponding to the hour is gradually revealed as time passes. The year after Urwerk unveiled these timepieces, Baumgartner was made an official member of the esteemed AHCI (Horological Academy of Independent Creators). The 103 Collection consists of the Urwerk UR-103 and the UR-103T. Both watches have a similar design, which features a rotating central element displaying the hours. This aligns with the curved minute indicator towards the bottom of the dial to show the exact time in hours and minutes. 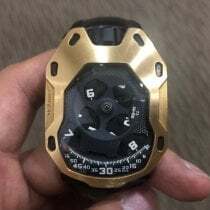 Both the UR-103 and the UR-103T have the central rotating cross element, which has four satellite rotating discs, but the black-and-silver UR103T has a redesigned cross and its aesthetic is modelled on the famous Tarantula spider. The UR-110 features more design innovation from Urwerk. This timepiece is made in five different variations. AS with the 103 collection, instead of a commonplace watch design, Urwerk has used a semi-circle indicator of minutes from 0 to 60. This is located on the right-hand side of the display, and the hours are indicated on rotating satellites which follow a vertical line, aligning with the minutes to give a precise reading of the time. The UR-110 RG is one option, consisting of a red gold bezel and black titanium internal components. Another option in this line from Urwerk is the UR-110 PT, which has a platinum bezel instead of the red gold on the UR-110 RG. Like the 103 Collection, the 200 Collection consists of two designs, the UR-202 and the UR-210. The overall mechanical principle in these timepieces is similar to that of the UR-103. A central element (which is triangular, instead of the four-armed element in the UR-103) displays hours on rotating satellites, and the hour markers rotate to align with the correct minute. This Urwerk timepiece also has an indicator towards the bottom right of the dial that displays the phase of the moon. One of the innovations that Urwerk introduced in this design was a new automatic winding system which makes use of compressed air. The watch has the distinction of being the first in the world to regulate the winding rate using fluid dynamics, another indication of Urwerk’s situation at the cutting edge of horological technology. As with the UR-110, the 200 collection is made in five distinctive variations. These include a design which features a white gold bezel. Urwerk has also crafted a signature masterpiece, the UR-1001. This ultra-premium timepiece measures not only seconds, minutes and hours, but also days, months, years and even centuries. Dual rotating indicators on the face of the watch display hours and months, with semi-circular dials showing minutes and the days of the month, so that these correspond to the hour and month elements respectively. 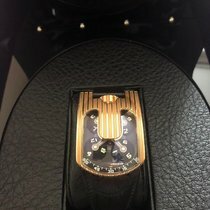 Urwerk has included a bar measuring years in the hundreds on the back of the case. The chain on which the UR-1001 is worn is hand-made by Urwerk, and consists of blackened steel links. 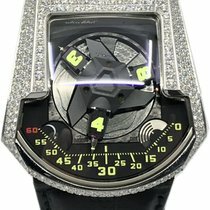 A number of celebrities have been seen sporting Urwerk. In 2012, legendary NBA basketball player Michael Jordan was photographed at a basketball game wearing the Urwerk 103, paired with a crisp black shirt. Other lovers of fast-paced action have also been seen wearing Urwerk watches – Jackie Chan, perhaps the most famous martial arts star since Bruce Lee, wore the UR-202 AIT in his film Good Guys, and was also photographed wearing the watch off the set, at the movie’s launch.